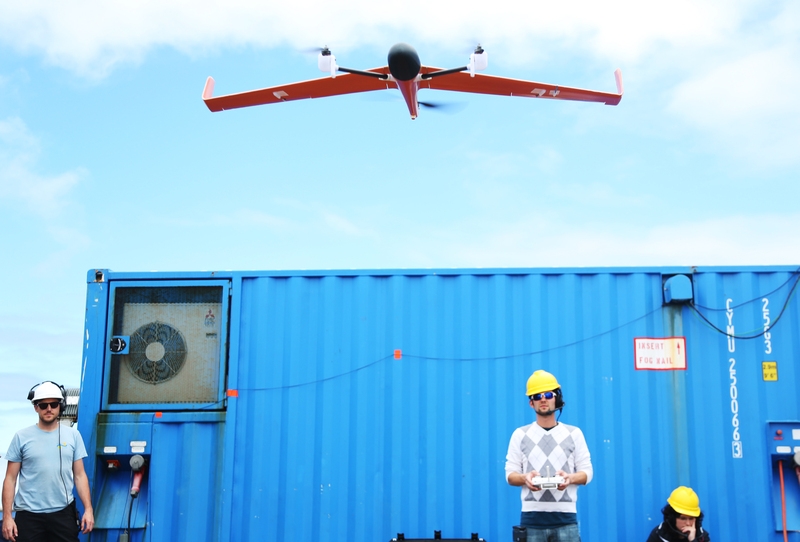 A Flightwave Edge UAV, piloted by Trent Lukaczyk, soars towards R/V Falkor, while a DJI Mavic, piloted by Manuel Ribeiro, follows behind. 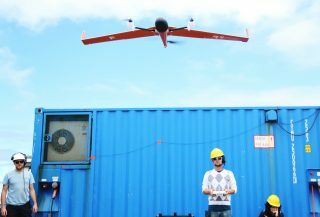 SAN DIEGO, CALIFORNIA – Using multiple autonomous vehicles simultaneously, an interdisciplinary team of scientists and engineers returns to the United States after exploring the North Pacific Subtropical front – a sharp boundary where cold fresh waters from the north meet warm salty waters from the south. The fronts are the most conspicuous oceanographic phenomena and the goal of this project was to demonstrate the use of distributed autonomous robotics to detect, track, and characterize these complex and dynamic processes with high accuracy across large spatial and temporal scales. 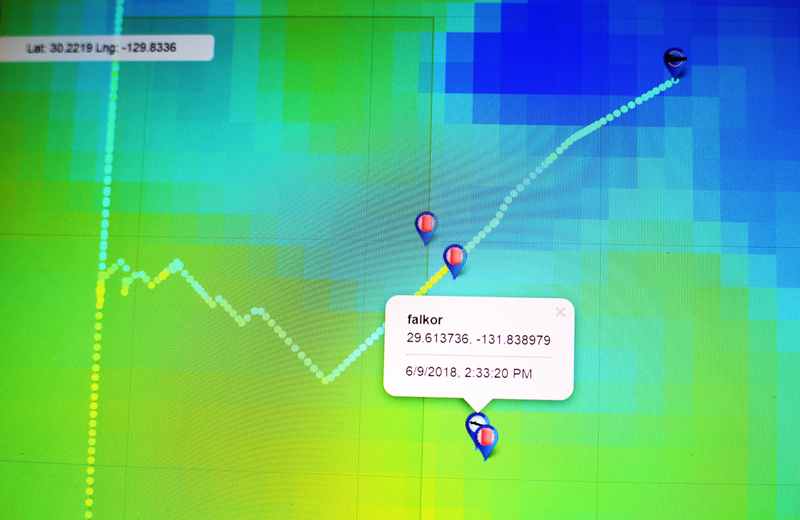 Bringing together aerial, surface, and underwater robotic vehicles with support from the research vessel Falkor, allowed the team to locate, map, and explore the front. It was detected approximately 1,000 nautical miles off the coast of Southern California several days ahead of the research party’s arrival using autonomous surface vehicles. Multiple low cost submarine, surface, and aerial robots joined the front exploration from Falkor. The resulting distributed robotic system and intelligent sensor network helped the research team to track the complex oceanic front dynamically, in an easier, faster, and more cost effective way that would be possible with traditional means, such as only relying on ships. Satellite observations are often not enough to track continuously changing ocean system. 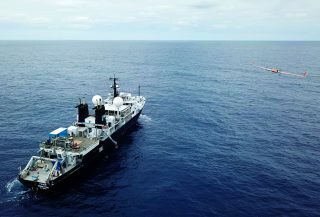 To locate the North Pacific front in the first place, this international group of scientists and engineers led by Dr. João Borges de Sousa, of the Laboratório de Sistemas e Tecnologia Subaquática (LSTS) from Porto University deployed one WaveGlider and two Saildrones into the target research area ahead of the ship’s arrival. 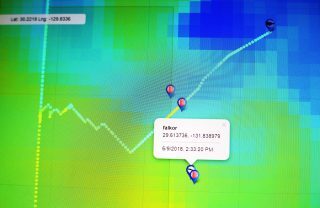 The data they acquired and transmitted to Falkor over satellite allowed the research party to optimize the deployment plans for all autonomous vehicles, including those that were delivered by and deployed from the vessel. Intelligent multi-vehicle control software, Ocean Space Center, developed at LSTS and deployed on Falkor was refined throughout the cruise to automatically optimize the operations of all deployed robots and facilitate the control of the robotic fleet for human operators. 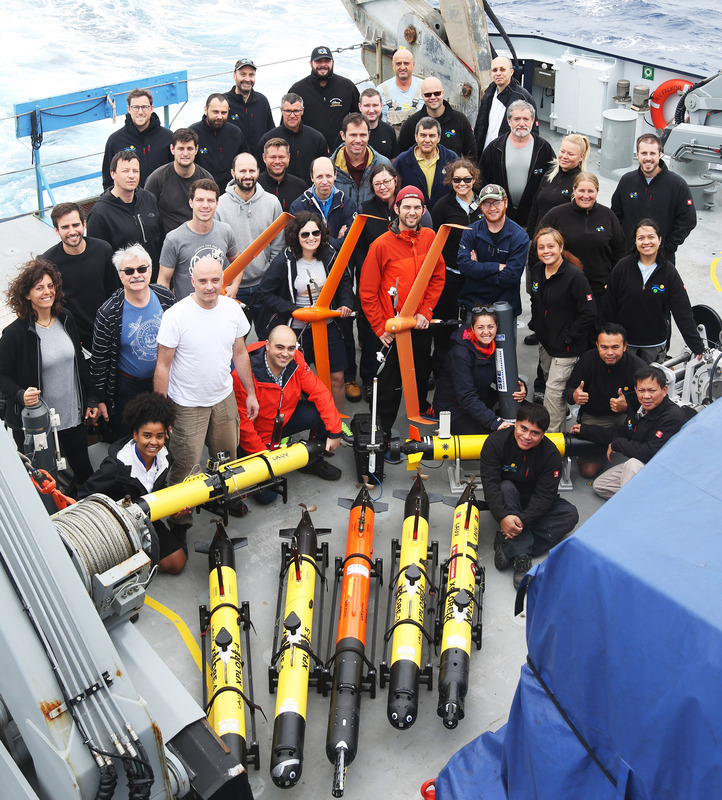 For the first time ever, a section of a major open-ocean front was mapped with sub-mesoscale resolution using a controlled fleet of dozens of autonomous robots. This detailed map of the ocean front dynamically composed from the acquired data enabled scientists to identify hotspots in which coordinated ship-robotic surveys were conducted with adaptive spatial and temporal resolution. Operation of multiple assets in open sea can be difficult but, in less than three weeks, the underwater robots travelled over 1,000 nautical miles for approximately 500 hours, while the autonomous surface vehicles operated continuously, and the unmanned aerial vehicles performed over 25 flights totaling 10 hours. This project demonstrates a novel approach for distributing the observations of complex ocean dynamics across multiple underwater, surface, and air vehicles. Instead of sampling from one vessel in a single location, researchers can now monitor a much larger area with high resolution in space and time in a scalable and cost-efficient manner using a networked fleet of robotic vehicles supported by a vessel-based command center. To enable a sustainable presence in the oceans, the group further developed their specific software called Neptus and Ripples, the software behind the Open Space Center, that allowed them to view and control the robots in real time, gaining advanced situational awareness, remote visualization, and control, all via the Internet. This software toolchain enabled them to control the ensemble of vehicles in several unprecedented ways, notably operating non-stop for most of the expedition with just one operator. Lessons learned and results obtained in this cruise can be applied to other frontal regions, as well as to other phenomena of the world Ocean. Thus, the technologies demonstrated in this expedition will help us to understand and monitor how key issues such as climate change, ocean acidification, unsustainable fishing, pollution, waste, loss of habitats and biodiversity, shipping, security, and mining are affecting global ocean sustainability and stewardship. You can learn more at: https://schmidtocean.org/cruise/exploring_fronts_with_multiple_aerial-surface-underwater-vehicles/. High resolution images and Broll of research vessel Falkor can be found here.